Here is my method, to get the most out of the LR 32-SYS with the FS 1080/2-LR 32 guide rail. First you will have to change the way you make your cabinet heights, for starters they MUST be in multiples of 32mm You might ask why must they be this length, and the answer: The jig will not be left or right specific and can be used any way, and believe me it is dead, balls on accurate. The second to last pic shows this. The Imperial mesurments are +/- But are just a guide line to get the height you want. 40" X 25.4mm =1016mm Divided by 32mm = 31.75 round up to 32 X 32mm = 1024 so thats how you get the magic number. Remember to always round up. Here is how you set up the guide rail, use both of the supplied bar stops that come with the kit and bolt them to the ends of the guide rail, use the last hole on each end (first pic). If these stops over lap by 16mm you have instaled them correctly. If you measure between the two stops it should be 1024. (second pic) shows the stops in place. In the second pic you can see how the cabinet gable is being held for drilling, by way of the stop clamped to the front of the MFT table. I use the Lee Valley bench pups to hold it there. The guide rail is held in place by two pins that are bored into the end stops on the sides of the MFT. They keep the guide rail in position to drill holes 37mm in from the edge. 37mm is the standard for euro style hinges that I use. (Third pic) shows this stop. I found that when you push the router along it wants to push against these pins, therfore there is no need to clamp the guide rail down. I drill my Cabinets on the day of assembly, this way you minimize the risk of error, It goes quite quik maybe a minute or two per Cabinet. When you set up for a new size you should move the end stp on the rail to the appropriate increment, so it holds nice and tight side to side. The beautiful part, is all your doors are drilled with 96mm centeres on each end, and doors with three hinges get drilled in the middle. Set up the drill press or the MFT and its a piece of cake! There are many combination, but the Idea is to find standard uses for the projects in your shop. Some people may feel that drilling holes all the way up the gable is better/faster but I feel that this look is not only generic looking, but kinda cheap. I feel that when a customer looks at the finished product It all looks balanced and well thought out, unlike some of the Production Kitchen shops that drill all there gables with same pattern. This leaves you thinking "somthing is missing here". Conclusion: The kit with all the Festool goodies, is great but it falls short in living up to being a easy to use (walk up and use) jig because there are too many parts, and the standard guide rail linear stops get in the way and can not be left on the rail for any of the combinations I have discribed in this post. Re: LR 32-SYS secrets explained! Thanks Mirko, it's a very nice tutorial. Mirko, great tutorial and great technique. Love the use of Wonder Dogs as micro adjusters. What are the colored dots? Office supplies? Did you clearcoat over them to make them permanent? Correct! "Gable" is Canadian for carcase side, I say Cabinet side when I must use Layman's Terms. The dots are from an office supply store, and so far they seem to stay put, that area on the rail is recessed so they do not come in contact with the router base. No need for clear coat. The wonder dogs only hold the "Gable" in place, all the stops on the jig ar fixed for the 37mm offset, its that perfect cut length that that keeps the holes lined up end on end. Glad I had some interest, I did alot of head scratching, to come up with this system. 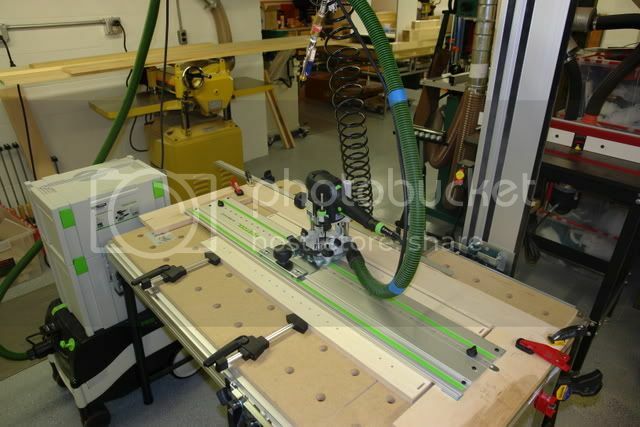 IMO the jig is worth the 400$$ Festool charges, if it is used like this. Mirko great thread, I love when someone else figures this stuff out for me! Thanks. The beautiful part, is all your doors are drilled with 96mm centers on each end, and doors with three hinges get drilled in the middle. Set up the drill press or the MFT and its a piece of cake! Gets me thinking, maybe you could make a door hinge jig, drill holes in a regular rail on 96mm centers. I might be hard to get the jig dead on, you would have to work out the spacing on 1/4" MDF first, but maybe. IMO its not worth while using this set up for doors, I think a drill press with left/right stops, works flawlessly. I am working on a jig that uses the OF 1400 and MFT to bore the holes. I just love the idea of the MFT and being able to take it to the job site. I am working on a jig that uses the OF 1400 and MFT to bore the holes. When you get it done, please post pictures. No problem, be glad to. Thank you very much Mirko. This is a great tutorial and an excellent reference! I don't get to do many cabinets, lots of shelves for closets, so that's why I get the LR 32. So I have only run holes all the way up for max adjustment of the shelves. But I do want to know how to better use this tool. So first how did you come up with the 25.4mm in you formula? And couldn't you just reset the end stops to get the offset to do the drill the doors? Your jig looks like it is set with 16mm offset, flip it over to the 32mm offset to drill the doors. Or am I missing something??? Like I said my experience is limited with frameless cabs so I could use all the help I can get. And again thanks, this thread has been a real help. 25.4mm is 1" and thats how you convert metric to imperial, of vice versa. The reason I do not use the jig for the doors is, the door is the same length as your gable, (1024mm max) so it fits inbetween the stops on the jig.In order to drill the door, the jig would have to shift over 16mm, but then it would be too short on one side. You could make it work for the shorter doors but I think it becomes too complicated at that point. The point of the jig is to make the drilling of any door to be hung, the same drilling on either end of the door. 96mm centers for all doors being drilled. The jig I'm doing now involves the OF 1400 mounted on the MFT with the stock fence in front of it, I got one extra flag stop, so that one will sit on either side of the 35mm bit. The door can now be pushed up to the fence positiond left or right on the flag stop, then drilled. Simple and care free. there are too many parts, and the standard guide rail linear stops get in the way and can not be left on the rail for any of the combinations I have discribed in this post. Yeah, the stops are a drawback in so many ways. Many thanks for sharing your simpler, faster way to use the LR 32. OK, for some reason I had it in my head 1"= 29.4mm, I got got it now. I like this idea, it does sound simple. Thanks for the how too Mirko. I am new with Festools and have not been able to totally digest all the information here yet, but I am working on it. I am finally getting around to making an actual shop in the basement we have been finishing. Festools fit my needs very well and will figure prominently in my plans. I just got my first Festools at Christmas and I am still in the process of learning my way around them. I have done a fair amount of construction on the 12 acres that contains our home and dog training club: two story 60x30 dog training club building, finished a basement, framed and finished a room in the attic, wood shed, 2 chicken houses, pool deck and I still have several more projects to do. I am at the stage where I need cabinets for the building and shop I work in. I have been trying to figure out whether or not the hole drilling system should be part of my Festool investment planing. I have been considering purchasing the LR 32 Set for use with 1400 Router. Since I have: MFT 1080 Table with the FS1080/2 Guide, Angle Stop/fence, FS 1400/2 Guide, 2 MFT Clamping Elements, 2 FSZ 120MM Clamps, LA 650 Fence, Flag Stop CS70, and MFT-LA Longitudinal Stop, I do not think I need the entire Hole Drilling kit. I know that I will need a fence drilled with holes. I would also like another FS/1400/2 Guide to attach to the one I already have, giving me enough guide rail length to rip the 8' dimention on a sheet of plywood. Unfortunately it does not appear that there is a FS/1400 length fence pre drilled with the holes. The FS1080/2-LR 32 attached to my FS 1400 does not give me enoug guide rail for cutting 8' sheets. I am wondering if I can drill the holes in a FS 1400 using my drill press? I would rather not have to buy several more guides. MacMitch, I don't think drilling your own holes would work out too well, I say sell some blood or some other way to get the money to buy more rails. First post in this forum. Yeah. I am new to frameless cabinets. I note that in the photos of the finished carcasses, the edges aren't taped. Do you tape after assembly, or do you finish the edges another way? Welcome Southern_guy, glad you're joining the fun. Looks to me as if the cab edges are taped. Tape is wood-colored. All the cabinets have cherry veneer, applied before assembly. Another Mirko inspired LS 32 jig in use ! Thanks Mirko. And also to Brice, Great stuff guys. Finally got to make the jig. And it was well worth the time spent to make it. It is fast and easy to use as advertised. The LS 32 set up, along with a few specialized tools has opened up 32 mm cabinetry for me. I have spent many hours learning about frameless 32mm cabinet construction. Tools, methods, hardware. The Festools seem to have been created for cabinet construction. Soon my original will be obsolete! In looking at your pictures one and two I have some questions. You are not mounting the Festool supplied stops in the manner recommended or shown by Festool (not a complaint by the way), correct? You have them mounted in the last hole to gain an extra 32 or 64 mm of length capacity, correct? Do you gain 16 or 32 mm doing it this way? Done this way, it would only work for the sides, or gables as the first hole would be 32mm from the edge. A hinge side would need 16, or do I have those reversed? Getting ready to build one this weekend, and just trying to Clarify a few items. I have the stops mounted to maximize the overall length of the jig, and the first hole for the base plate will drill @ 80 mm, this puts the base plate on 96 mm centers for the door drilling. I don't use the jig for drilling the doors, its to easy to use a dedicated drill press. The two pins that stop the rail and position it are needed with my setup, reason being when the stops on the end of the rail are mounted in the furthest position, the locating pin is not used, so the stops will rotate a little if bumped. These stops only prevent end to end movement, so this is NOT a problem, providing you are using the rear locating pins to set the front to back dimension. How about that door jig? So, I just now started reading about the 32mm system. I went to fancy furniture building school, everything was in inches, and cut by hand using chisels and hand saws... this 32mm thing is all brand new to me. Yep, I'm that guy. I've got the Festool Addiction so, I'm just updating this post with more festools. The below youtube video blends Mirko's "LR 32-SYS Secrets Explained" with the Parallel Guides. I can't wait to get my kitchen started. The pics will not expand. Is there a secret? No secret. There was a catastrophic loss of data on FOG about 5 years ago. All picture attachments were lost. In some posts authors re-uploaded their pictures. Contact the author.